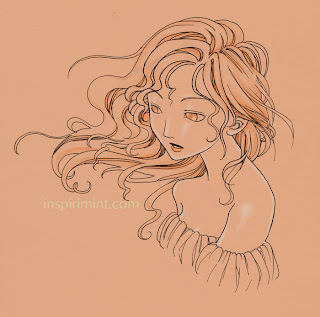 This week, I started out drawing a girl with her hair blown in the wind, but the more I worked on it, the more it began to resemble Pepper Breeze by Artgerm. In this picture, I really wanted to draw heavily layered hair. I don't know why but I love drawing curly hair, even though I have such a hard time getting it to look right. Here, I got a little lazy with the curls which is why some parts look curly, while other parts only look wavy or even straight. As I was inking this picture, I was reminded why I like drawing girls with short hair. What kind of hair do you like drawing? It must be the "grass is greener on the other side" effect, but I like wavy/ curly hair. Not that I could render either of them well.